I obtained my PhD in 1995 from the University of Bielefeld/Germany with a thesis on the development of the nervous system in zoea and megalopa larvae of Hyas araneus and Carcinus maenas tutored by Ralph Dawirs, an expert in larval ecophysiology. I did much of the experimental work for my thesis in the lab of Klaus Anger at the Biologische Anstalt in Helgoland. During a postdoctoral period in Barbara Beltz’s lab at Wellesley College/Massachusetts I worked on embryonic neurogenesis in the brain, ventral nerve cord and visual system of the American lobster with immunohistochemical methods, fluorescence and confocal laser-scan microscopy and with mitosis markers. I then moved to the University of Ulm/Germany where I was hosted by Dieter Waloszek (Dept. Biosystematic Documentation), a renowned crustacean paleaeontologist, and Harald Wolf (Neurobiology) an arthropod neurobiologist. In Ulm, I expanded my studies to comparative developmental studies (“Evo/Devo”) on the nervous system of e.g. Artemia salina, Triops cancriformis, Leptestheria dahalacensis and the parthenogenetic marbled crayfish, but also to other arthropod taxa such as Limulus polyphemus (with Barbara Battelle at the Whitney Lab, Florida), scorpions (with Harald Wolf) and myriapods. In these years, I promoted the discipline “neurophylogeny” (the term being coined by Dorothy Paul), that is a synthesis of neurobiological studies and phylogenetic aspects, much fueled by my hosts which as experts in paleontology versus neurobiology inspired my multidisciplinary approach. Since Ulm, much of my research is centered around the question “What can structure and development of the arthropod nervous system tell us about arthropod phylogeny?”. I obtained my habilitation in 2001 and continued to work in Ulm on a Heisenberg stipend by the Deutsche Forschungsgemeinschaft. A study on neurophylogeny of remipede crustaceans together with Martin Fanenbruck and Wolfgang Waegele brought about a new hypothesis on these animal’s phylogenetic affinities. Side projects concerned muscle development in lobster and isopod embryos. In 2006, I moved to Bill Hansson’s group “Evolutionary Neuroethology” at the Max Planck Institute for Chemical Ecology in Jena/Germany as group leader in neuroanatomy. Bill is primarily interested in the evolution of arthropod olfactory systems and his group applies a broad spectrum of methods from immunohistochemistry, imaging, 3D reconstruction across molecular methods to neurophysiology and behavioral essays. My work in Jena focused on the crustacean olfactory system during the evolutionary transition from sea to land. To that that end, I compared the central olfactory pathway between marine and terrestrial isopods, marine and terrestrial brachyurans, and, most notably, marine and terrestrial anomurans. In the course of these studies I had the chance to work on the giant robber crab Birgus latro on Christmas Island/Indian Ocean. I was not only responsible for studying the brain structure of this remarkable beast but also coordinated a telemetric study on these animals’ behavior using GPS transponders. I will be on Christmas Island again December 2010 with new GPS tags to study olfactory driven behaviors and migrations of these animals! In 2008, I obtained tenure as professor in Cytology and Evolutionary Biology at the Zoological Institute of the University of Greifswald/Germany, a quaint small town at the Baltic coast with a university that goes back to 1456. Although the neighboring University Rostock is some twenty years older, I maintain a fruitful collaboration with Stefan Richter’s group in Rostock. Greifswald is also strategically well situated for interactions with other carcinologists such as Gerhard Scholtz’ group in Berlin or Jens Hoeg’s lab in Copenhagen as well as colleagues e.g. in Lund, Stockholm and Helsinki. We are also actively establishing scientific contacts to Poland (Stettin, Posznan, Warsaw) and further East. My department uses methods such as immunoflourescence, confocal laser-scan microscopy, 3D reconstruction (Amira, Imaris) TEM and SEM to analyze the nervous systems of crustaceans (currently e.g. Nebalia bipes, Saduria entomon, Coenobita clypeatus, more Birgus) but also of myriapods (centipedes and millipedes) in an evolutionary context. We also try to integrate ethological aspects wherever possible and to that end maintain a strong collaboration with Bill Hansson’s group at the MPI in Jena. Spitzner F, Meth R, Krüger C, Nischik ES, Eiler S, Sombke A, Torres G, Harzsch S. (2018) An atlas of larval organogenesis in the European shore crab Carcinus maenas L. (Decapoda, Brachyura, Portunidae). Frontiers in Zoology 15:27. Wittfoth C, Harzsch S (2018) Adult neurogenesis in the central olfactory pathway of dendrobranchiate and caridean shrimps: new insights into the evolution of the deutocerebral proliferative system in reptant decapods. Developmental Neurobiology 78(8): 757-774. Harzsch S, Krieger J (2018) Crustacean olfactory systems: a comparative review and a crustacean perspective on insect olfactory systems. Progress in Neurobiology 161:23-60. Download via scienceirect.com. Torres G., Spitzner F., Harzsch S., Gimenez L. (in press) Ecological Developmental Biology and global ocean change: brachyuran crustacean larvae as models. In: Perspectives on evolutionary (and) developmental biology. Giuseppe Fusco (ed. ); Padova University Press. Meth R, Wittfoth C, Harzsch S (2017)Brain architecture of the Pacific White Shrimp Penaeus vannamei Boone, 1931 (Malacostraca, Dendrobranchiata): correspondence of brain structure and sensory input? Cell and Tissue Research 369(2): 255–271. Audo D, Haug JT, Haug C, Charbonnier S, Schweigert G, Müller CHG, Harzsch S (2016) On the sighted ancestry of blindness - exceptionally preserved eyes of Mesozoic polychelidan lobsters. Zoological Letters 2:13. Harzsch S, von Bohlen und Hallbach O. (2016) A possible role for the immune system in adult neurogenesis: new insights from an invertebrate model. Zoology 119(2):153-157. Hörnig MK, Sombke A, Haug C, Harzsch S, Haug JT (2016). What nymphal morphology can tell us about parental investment - a group of cockroach hatchlings in Baltic amber documented by a multi-method approach. Palaeontologia Electronica 19.1.6A. Krieger J, Drew MM, Hansson BS, Harzsch S (2016) Notes on the foraging strategies of the Giant Robber Crab Birgus latro (Anomala) on Christmas Island: Evidence for active predation on Red Crabs Gecarcoidea natalis (Brachyura). Zoological Studies 55:6. Harzsch S, Perez Y, Müller CHG (2016) Chaetognatha. In: Schmidt-Rhaesa A, Harzsch S, Purschke G. (Eds.). 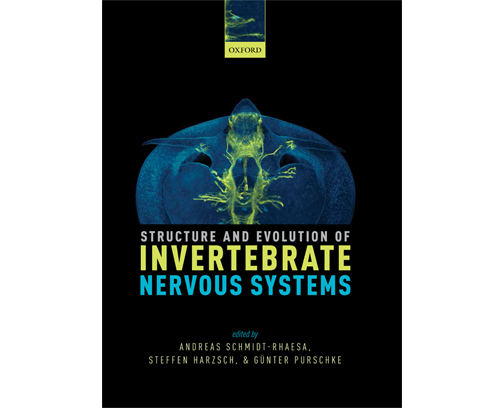 Structure and Evolution of Invertebrate Nervous Systems. Oxford University Press, pp. 652-664. Batelle BA, Sombke A, Harzsch S (2016) Xiphosura. In. Schmidt-Rhaesa A, Harzsch S, Purschke G. (Eds.) Structure and Evolution of Invertebrate Nervous Systems. Oxford University Press, pp. 428-442. Stemme T, Harzsch S (2016) Remipedia. In: A. Schmidt-Rhaesa, S. Harzsch, G. Purschke (Eds.). Structure and Evolution of Invertebrate nervous Systems. , Oxford University Press, pp. 522-528. Lehmann D, Melzer RR, Hörnig MK, Michalik P, Sombke A, Harzsch S (2016) Arachnida - excl. Scorpiones. In: A. Schmidt-Rhaesa, S. Harzsch, G. Purschke (Eds.). Structure and Evolution of Invertebrate nervous Systems. , Oxford University Press, pp. 453-477. Tuchina O, Koczan S, Harzsch S, Rybak J, Wolff G, Strausfeld NJ, Hansson BS (2015) Central projections of antennular chemosensory and mechanosensory afferents in the brain of the terrestrial hermit crab (Coenobita clypeatus; Coenobitidae, Anomura). Frontiers in Neuroanatomy 9:94. Grunow B, Kirchhoff T, Lange T, Moritz T, Harzsch S (in press) Histochemistry on vibratome sections of fish tissue: a comparison of fixation and embedding methods. Aquatic Biology. doi 10.3354/ab00624. Sombke A, Harzsch S (2015) Immunolocalization of histamine in the optic neuropils of Scutigera coleoptrata (Myriapoda: Chilopoda) reveals the basal organization of visual systems in Mandibulata. Neuroscience Letters 594: 111-116. Kress T, Harzsch S, Dircksen H (2015) Neuroanatomy of the optic ganglia and central brain of the water flea Daphnia magna (Crustacea, Cladocera). Cell and Tissue Research: DOI 10.1007/s00441-015-2279-4. Harzsch S , Krieger J, Faulkes Z (2015) Astacida. In: A Wanninger (ed.). 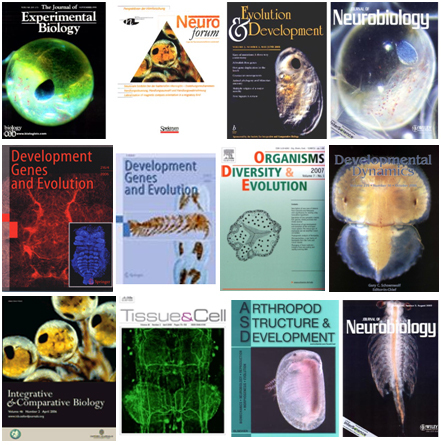 Evolutionary Developmental Biology of Invertebrates, Springer, pp: 101-152. Harzsch S, Müller CHG, Perez Y (2015) Chaetognatha. In: A Wanninger (ed.). Evolutionary Developmental Biology of Invertebrates, Springer, pp: 215-240. Ito K, Shinomiya K, Ito M, Armstrong JD, Boyan G, Hartenstein V, Harzsch S, Heisenberg M, Homberg U, Jenett A, Keshishian H, Restifo LL, Rössler W, Simpson JH, Strausfeld NJ, Strauss R, Vosshall LB, Insect Brain Name Working Group (2014) A Systematic Nomenclature for the Insect Brain. Neuron 81(4): 755-765. Müller CHG; Rieger V, Perez Y & Harzsch S (2014). Immunohistochemical and ultrastructural studies on ciliary sense organs of arrow worms (Chaetognatha). Zoomorphology 133:167-189. Perez Y, Müller C, Harzsch S (2014) The Chaetognatha: an anarchistic taxon between Protostomia and Deuterostomiea. In: Wägele JW, Bartholomaeus TW, Misof B (Eds.). Deep metazoan phylogeny: The backbone of the tree of life: New insights from analyses of molecules, morphology, and theory of data analysis. pp: 49-78, Walter de Gruyter, Berlin. Sandeman D, Kenning M, Harzsch S (2014) Adaptive trends in malacostracan brain form and function related to behaviour. In: Derby C and Thiel M (Eds.) Crustacean Nervous System and their Control of Behaviour. The Natural History of the Crustacea. Vol. 3. pp: 11-48, Oxford University Press. Zieger E, Bräunig P, Harzsch S (2013): A developmental study of serotonin-immunoreactive neurons in the embryonic brain of the Marbled Crayfish and the Migratory Locust: evidence for a homologous protocerebral group of neurons. Arthropod Structure & Development. 42(6): 507-520. Perez Y, Rieger V, Martin E, Müller C, Harzsch S (2013) Neurogenesis in an early protostome relative: progenitor cells in the ventral nerve centre of chaetognath hatchlings are arranged in a highly organized geometrical pattern. Journal of Experimental Zoology Part B: Molecular and Developmental Evolution. 320(3):179-193. Kenning M, Müller C, Wirkner CS, Harzsch S (2013) The Malacostraca (Crustacea) from a neurophylogenetic perspective: new insights from brain architecture in Nebalia herbstii Leach, 1814 (Leptostraca, Phyllocarida). Zoologischer Anzeiger 252: 319-336. Kapp H, Müller C, Harzsch S (2013). Chaetognatha. In: "Spezielle Zoologie. Teil 1: Einzeller und Wirbellose Tiere". Westheide W, Rieger G (eds.). Springer Spektrum Verlag, pp. 812-817. Polanska M, Tuchina O, Agricola H, Hansson BS, Harzsch S (2012) Neuropeptide complexity in the crustacean central olfactory pathway: immunolocalization of A-type allatostatins and RFamide-like peptides in the brain of a terrestrial hermit crab. Molecular Brain. 5:29. Stemme T, Iliffe TM, Bicker G, Harzsch S, Koenemann S (2012) Serotonin immunoreactive interneurons in the brain of the Remipedia: new insights into the phylogenetic affinities of an enigmatic crustacean taxon. BMC Evolutionary Biology. 12:168. doi:10.1186/1471-2148-12-168. Wolff G, Harzsch S, Hansson BS, Brown S, Strausfeld NJ (2012) Neuronal organization of the hemiellipsoid body of the land hermit crab Coenobita clypeatus: correspondence with the mushroom body ground pattern. Journal of Comparative Neurology 520: 2824-2846. Wolf H, Harzsch S (2012) Serotonin-immunoreactive neurons in scorpion pectine neuropils: similarities to insect and crustacean primary olfactory centres? Zoology 115: 151-159. Sombke A, Lipke E, Kenning M, Müller CHG, Hansson BS, Harzsch S. (2012) Comparative analysis of deutocerebral neuropils in Chilopoda (Myriapoda): implications for the evolution of the arthropod olfactory system and support for the Mandibulata concept. BMC Neuroscience 13:1. Sintoni S, Benton JL, Beltz BS, Hansson BS, Harzsch S (2012) Neurogenesis in the central olfactory pathway of adult decapod crustaceans: development of the neurogenic niche in the brains of Procambarid Crayfish. Neural Development 7: 1. Sandeman D, Kenning M, Harzsch S. (accepted pending revisions). Adaptive trends in malacostracan brain form and function related to behaviour. In: Derby C and Thiel M (Eds.) Crustacean Nervous System and their Control of Behaviour. The Natural History of the Crustacea. Vol. 3. Harzsch S, Sandeman D, Chaigneau J (2012) Morphology and development of the central nervous system. In: Forest J and von Vaupel Klein JC (Eds.). Treatise on Zoology – Anatomy, Taxonomy, Biology. The Crustacea Vol. 3. Brill, Leiden pp. 9-236. Rieger V, Perez Y, Müller CHG, Lacalli T, Hansson BS, Harzsch, S (2011) Development of the nervous system in hatchlings of Spadella cephaloptera (Chaetognatha), and implications for nervous system evolution in Bilateria. Development, Growth and Differentiation 53:740-759. Missbach C, Harzsch S, Hansson B (2011) New insights into an ancient insect nose: the olfactory pathway of Lepismachilis y-signata (Archaeognatha: Machilidae). Arthropod Structure & Development 40:317-333. Harzsch S, Rieger V, Krieger J, Seefluth F, Strausfeld NJ, Hansson BS (2011) Transition from marine to terrestrial ecologies: Changes in olfactory and tritocerebral neuropils in land-living isopods. Arthropod Strcuture and Development 40: 244-257. Sombke A, Harzsch S, Hansson BS (2011): Organization of deutocerebral neuropils and olfactory behavior in the centipede Scutigera coleoptrata (Linnaeus, 1758) (Myriapoda: Chilopoda). Chemical Senses 36: 43-61. Hansson BS, Harzsch S, Knaden M & Stensmyr M (2011) The neural and behavioral basis of chemical communication in terrestrial crustaceans. In: Chemical communication in Crustaceans., Breithaupt T., Thiel M. (eds. ), Springer, 201: 149-174. Stemme T, Bicker G, Harzsch S, Koenemann S (2010) Die rätselhaften Grottenkrebse der Blue Holes. Sind Remipedia primitive Crustaceen oder schwimmende Insekten? Naturhistorica 152: 7-28. Richter S, Loesel R, Purschke G, Schmidt-Rhaesa A, Scholtz G, Stach T, Vogt L, Wanninger A, Brenneis G, Döring C, Faller S, Fritsch M, Grobe P, Heuer CM, Kaul S, Møller OS, Müller CHG, Rieger V, Rothe BH, Stegner MEJ, Harzsch S (2010). Invertebrate neurophylogeny - suggested terms and definitions for a neuroanatomical glossary. Frontiers in Zoology 7:29. Harzsch S, Kreisl S (2010) Myogenesis in the thoracic limbs of the American lobster. Arthropod Structure & Development 39: 423-435. Drew MM, Harzsch S, Stensmyr M, Erland S, Hansson BS (2010) A review of the biology and ecology of the Robber Crab, Birgus latro (Linnaeus, 1767) (Anomura: Coenobitidae). Zoologischer Anzeiger 249: 45-67. Rieger V, Perez Y, Müller CHG, Lipke E, Sombke A, Hansson BS, Harzsch S (2010) Immunohistochemical analysis and 3D reconstruction of the cephalic nervous system in Chaetognatha: insights into an early bilaterian brain? Invertebrate Biology 129(1): 77-104. Sombke A, Harzsch S, Hansson BS (2009): Brain structure of Scutigera coleoptrata: New insights into the evolution of mandibulate olfactory centers. - Soil Organisms 81 (3): 319-325. Harzsch S, Wanninger A (2009) Evolution of invertebrate nervous systems: the Chaetognatha as a case study. Acta Zoologica 91: 35-41. Harzsch S (2007) Architecture of the nervous system as a character for phylogenetic reconstructions: examples from the Arthropoda. Species, Phylogeny & Evolution 1: 33-57. Stavenga DG, Harzsch S (2007) Origin and evolution of arthropod visual systems: introduction to Part II. Arthropod Struct. Dev.36: 371-372. Harzsch S, Melzer RR (2006) Editorial: origin and evolution of arthropod visual systems. Arthropod Struct. Dev. 35: 209-210. Harzsch S, Hafner G (2006) Evolution of eye development in arthropods: phylogenetic implications. Arthropod Struct. Dev. 35: 319-340. Harzsch S (2006) Neurophylogeny: architecture of the nervous system and a fresh view on arthropod phyologeny. Comp. Integr. Biol. 46: 162-194. Harzsch S (2005) Bookreview of “Evolutionary Developmental Biology of Crustacea”, Crustacean Issue, edited by G. Scholtz. J. Zool. Systemat. Evol. Res. 43: 344-345. Harzsch S, Müller CHG, Wolf H (2005) From variable to constant cell numbers: cellular characteristics of the arthropod nervous system argue against a sister-group relationship of Chelicerata and “Myriapoda” bur favour the Mandibulata concept. Dev. Genes. Evol. 215: 53-68. Harzsch S, Glötzner J (2002) An immunohistochemical study on structure and development of the nervous system in the brine shrimp Artemia salina Linnaeus, 1758 (Branchiopoda, Anostraca) with remarks on the evolution of the arthropod brain. Arthropod. Struct. Dev. 30: 251-270. Wildt M, Harzsch S (2002) A new look at an old visual system: structure and development of the compound eyes and optic ganglia of the brine shrimp Artemia salina Linnaeus, 1758 (Branchiopoda, Anostraca). J. Neurobiol. 52: 117-132. Wolf H, Harzsch S (2002) Evolution of the arthropod neuromuscular system: 1. Arrangement of muscles and excitatory innervation in the walking legs of the scorpion Vaejovis spinigerus (Wood, 1863) (Vaejovidae, Scorpiones, Arachnida). Arthropod Struct. Dev. 31: 185-202. Harzsch S (2003) Ontogeny of the ventral nerve cord in malacostracan crustaceans: a common plan for neuronal development in Crustacea, Hexapoda and other Arthropoda? Arthropod Struct. Dev. 32: 17-37.